This is a real classic in Liege-Bastogne-Liege and so hard to do ! You are on a downhill from the cote de Wanne, at speeds of around 50-60km/u easily, you turn right and find yourself in front of a wall. And when you think the end is near, a turn to left and right will make you sweat even more. Good luck ! I've done this climb 2 years ago, and reached a ridiculous heart rate. Looking at the map though I think I might have done the "shortcut" over the Cote de Stockeu. That must be even steeper than the "official" route on this map. Anyone know more about this shortcut? 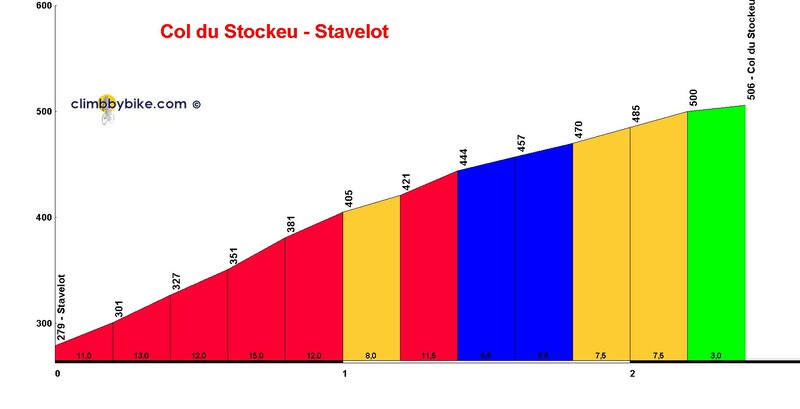 I'm going back to Stavelot next week, and surely going to climb this one again.